Among the hustle and bustle of 14th Street’s trendiest bars and restaurants lies an art studio home to one of D.C.’s most beloved artists, Brian Petro. This small workspace, lined with brick and exposed beams, is packed with works of art Petro has created over the decades. Working as professional artist for years, Petro spent much of his time bouncing between New York and Washington, exhibiting at galleries and working on commissions from clients like Absolut Vodka, Ritz-Carlton Hotels and the Library of Congress. But a few years ago, Petro decided to stay-put with a permanent studio space in the District, directly below the 14th Street contemporary home furnishing store, Vastu. At Vastu, Petro works as a kind-of “resident artist and curator,” exhibiting his own art on the walls and also contracting other artists to display their work in the store. Currently, some of Petro’s latest artwork adorns the expansive space at Vastu, including pieces from Supermarket Series and Roman Series. And while both are drastically different in look and media used, the two series have one thing in common: the artwork is influenced by different periods of time in Petro’s life. The colorful and vibrant pieces in Supermarket Series pay homage to Petro’s time spent working in the produce department at a grocery store in central Pennsylvania. 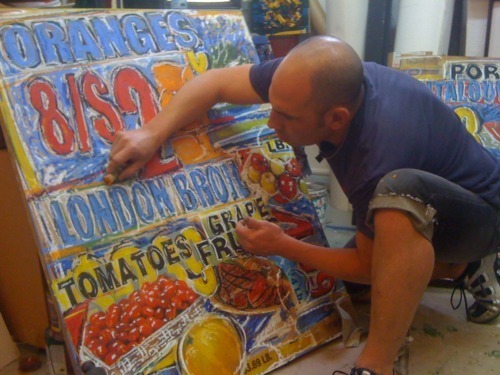 Supermarket Series embodies more than Petro’s time spent in Pennsylvania; the series is also inspired by old grocery and bodega signs that Petro found while dumpster diving for found-art in Manhattan – A city he loves and describes as gritty, yet bright and energetic. Similarly, the more somber pieces in Roman Series were inspired from another period of time in Petro’s life. When he was 22, Petro took his first trip to Europe and spent some time in Rome and other cities throughout Italy. “I was just floored by Italy,” said Petro, who attempts capture the complexity of Roman society with simple, stoic gazes of ancient statues and ruins. Petro’s work will be displayed in Vastu through July 16. 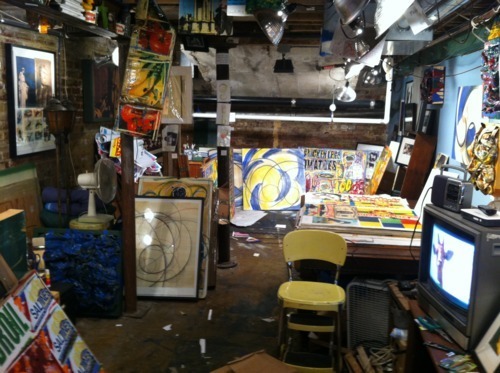 Additionally, Petro will open his studio to the public this weekend for the Mid City Artists Open Studio tours. Petro will be on-hand to show his work and answer questions from visitors from 11am until 6:30pm on Saturday and noon until 4:30pm on Sunday. Interested persons can also schedule a free personal tour of Brian’s studio until July 16 by phoning the artist directly at (202) 270-7352. For more information, visit http://www.brianpetro.com.